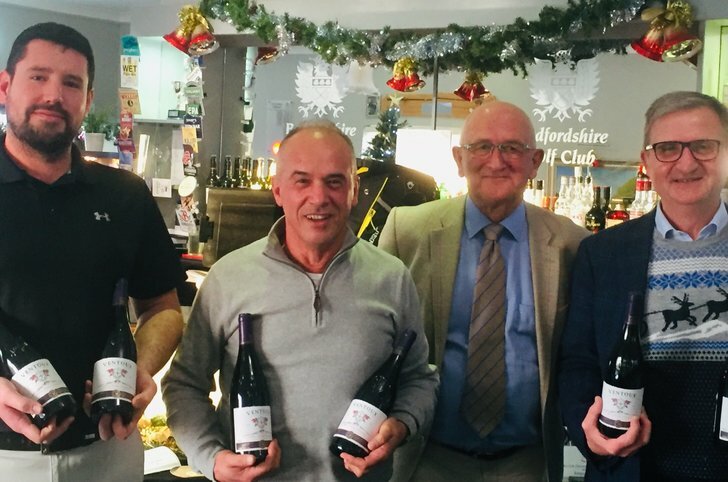 The Annual B.O.G.S winter competition and Christmas lunch took place on Saturday 8th December. This event is also the 2nd round of the coveted annual B.O.G.S championship where the aggregate of the scores from the summer and winter competitions determines the overall B.O.G.S champion of the year. 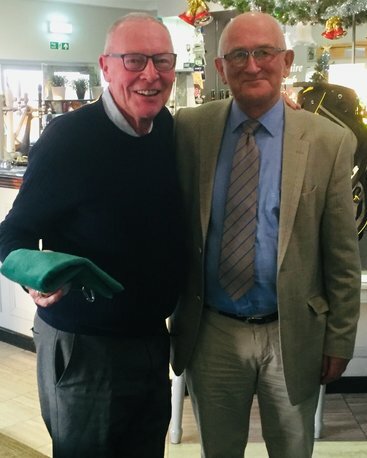 The days event was well attended with 39 B.O.G.S and 6 guests including Club Captain, Jim Godfrey and Club President, Roger Willis as well as some of the club professionals. It was an early start to the day with the dawn only just breaking as everyone assembled for the traditional whisky and coffee pre competition warm up and banter in the clubhouse. Despite the early start everyone turned up on time in anticipation of the great day ahead. B.O.G.S captain John Farnworth called everyone to order and announced the order of play and outlined the various competitions and prizes up for grabs. The course and greens in particular were in great condition despite still recovering from the summer drought. This helped with some high scoring on the day and ensured everyone was round in under 4 hours and were ready for the greatly anticipated Christmas lunch with over 15 minutes to spare. Winning team with 113 points - Richard Kemp, Nic Serrecchia & Tony Peluso. 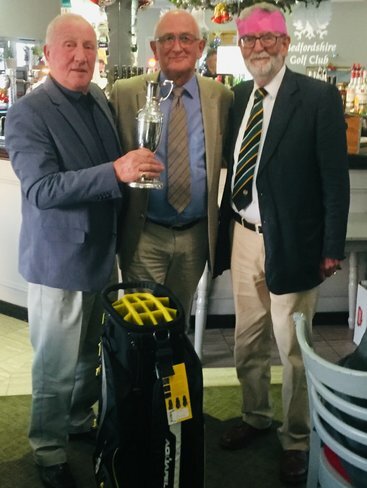 This year was the second year of the B.O.G.S special award for outstanding contribution to the B.O.G.S ethos and is nominated and passed down from the previous years winner. 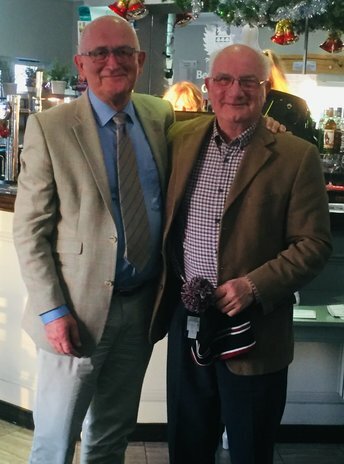 Although last years winner,Peter Gill was not present he had provided an entertaining, if not a little confusing, background to why he had chosen this years winner. 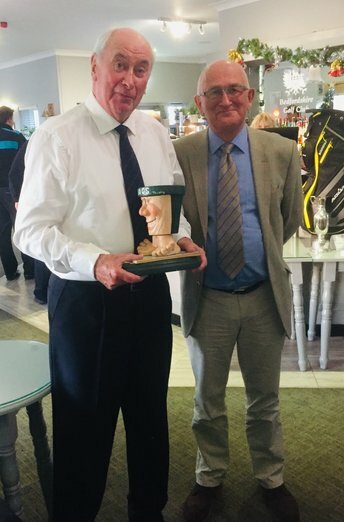 As probably the most consistent player in the B.O.G.S and someone with the best ratio of age to handicap, this years popular winner was Brian Allen pictured below with the Art Deco trophy. All aspects of the catering and bar service were first rate and huge thanks go to Ruth and her team along with Debbie & her team in the kitchen. Another great day of golf, competition, good humour, great food and great achievements. All part of being in the B.O.G.S. 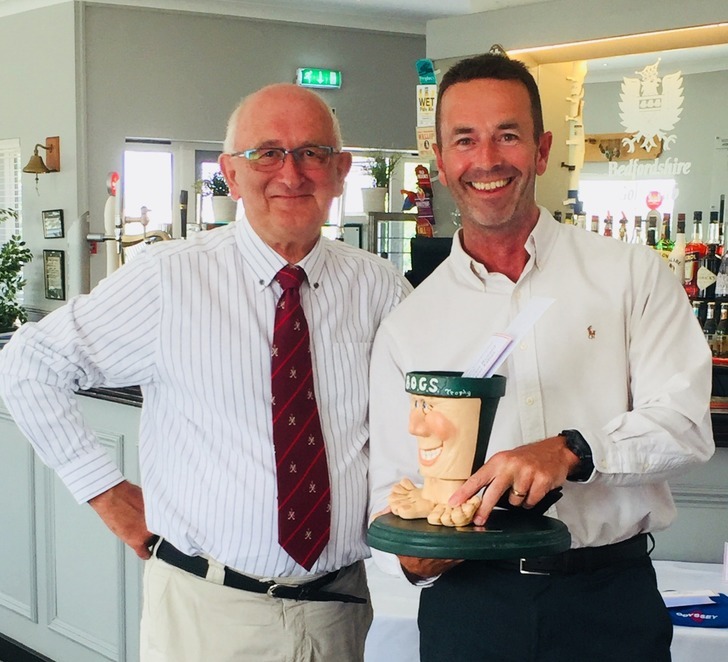 The most feared and typically least contested award is the renowned porcelain trophy that recognises the golfer who put in the most effort for the least reward. 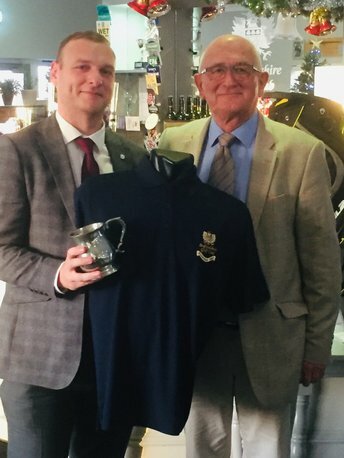 This years proud winner of this trophy was David Richardson pictured below. There was a fiercely fought battle of the best guests, particulary amongst the professionals. However there was no match to a very impressive round of gross 63 ! and 43 points from Richard Kemp pictured below. 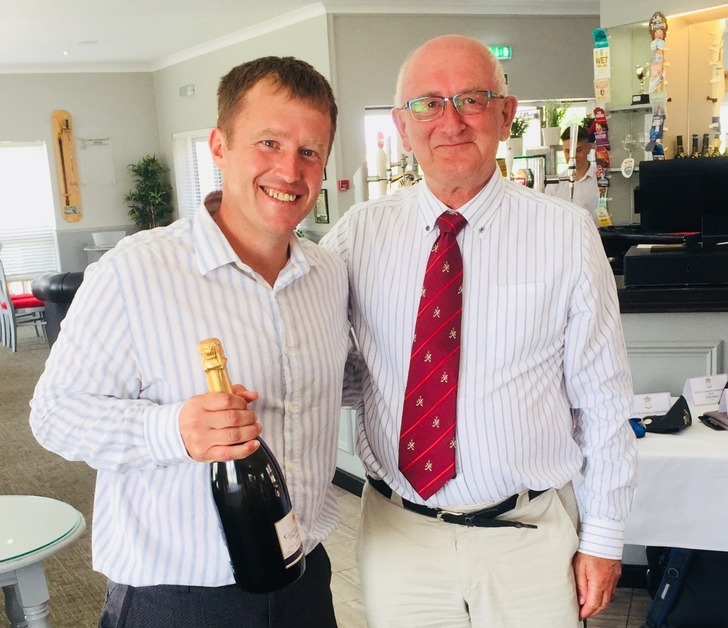 Richard also won the longest drive on the 18th. 1st place and overall BOGS Champion with 77 points - BRIAN ALLEN pictured below. B.O.G.S. Annual Championship The B.O.G.S Annual Championship is played over two rounds – one in the summer and one in the Winter. Each round is an event in itself with a number of prizes awarded including the B.O.G.S summer champion and the B.O.G.S winter champion. Each event is followed by a celebratory dinner and prize giving. 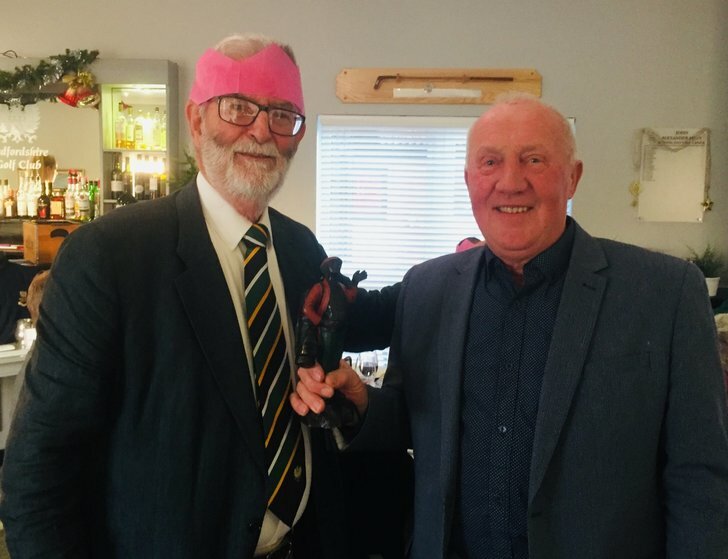 The coveted B.O.G.S champion award is given to the player with the most points over the two rounds and is awarded at the winter event as part of the B.O.G.S Christmas dinner. 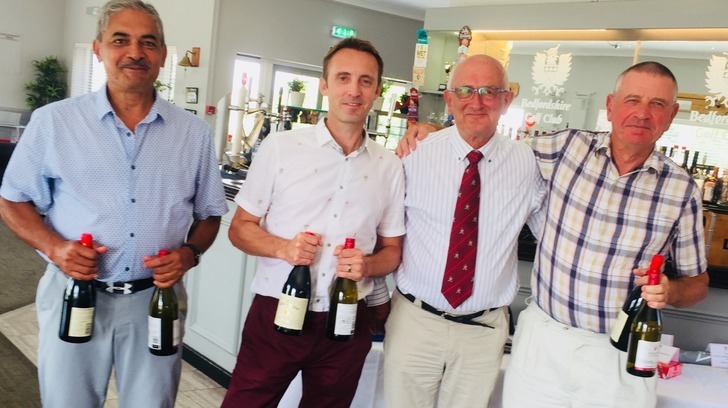 The Annual B.O.G.S summer competition and lunch took place on Saturday 21st July with a great turn out of 41 Members of the B.O.G.S along with 7 guests, including club President Roger Willis and Head Professional Geraint Dixon and his team. All assembled in the clubhouse at 7.30am on what was yet another glorious sunny and somewhat humid morning. All competitors were treated to a pre round warm up of coffee and whiskey shots and the usual early banter and speculation of the days potential winners. 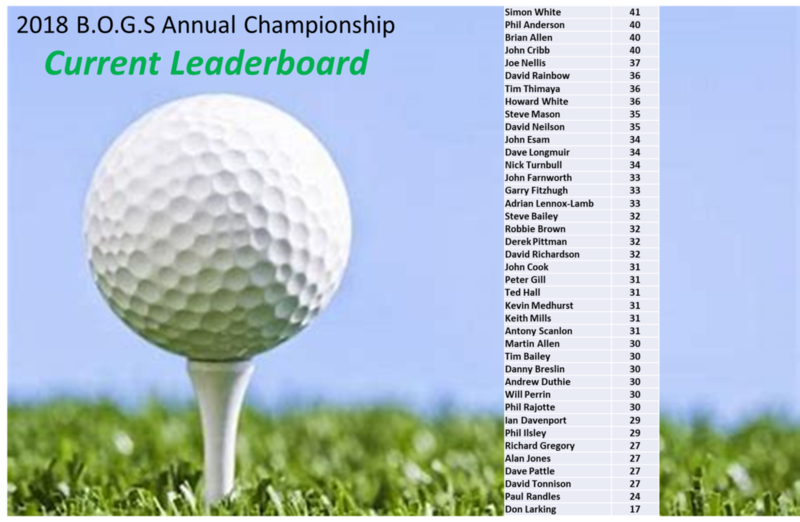 The summer comp is the first round of the coveted overall B.O.G.S champion presented at the end of the winter competition in December. So everyone was keen to record a good score to keep them in the running. 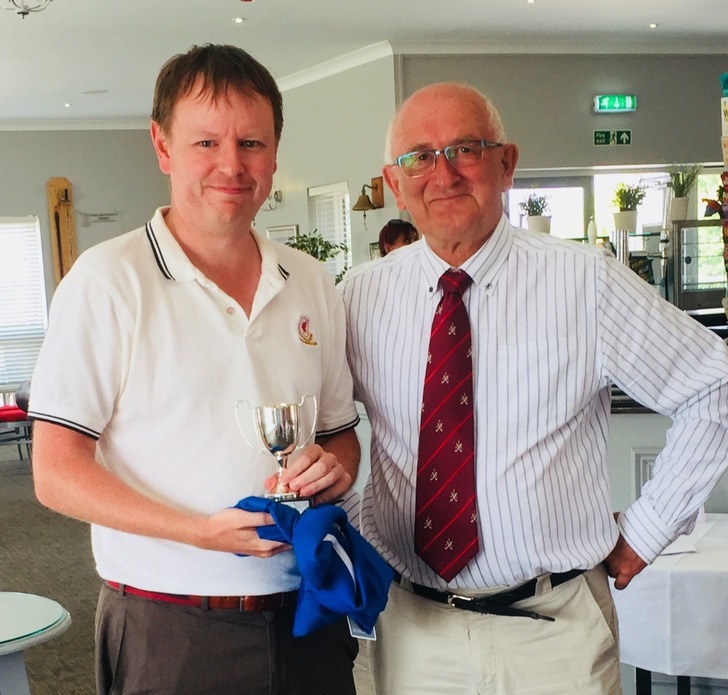 As ever the course was in great condition despite the long dry spell and with a number of prizes up for grabs the competition was fierce resulting in very high scoring from most (but not all) competitors. The final award of the day was the now traditional porcelain trophy presented to the competitor who has put in the most effort for the least reward (points scored for this trophy are never published). 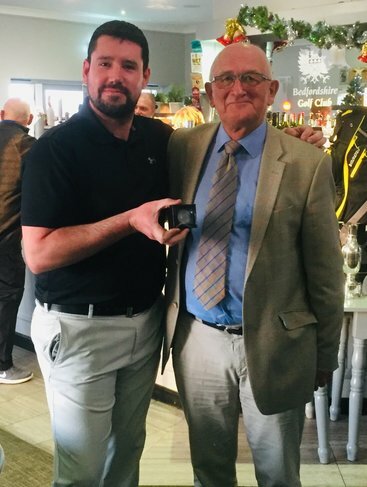 The proud owner of this recognition was Paul Randles (pictured with the sought after trophy). Most Effort - Least Reward! All agreed that the day’s events had, as usual, been very enjoyable and everyone looked forward to the winter version in December.